Muscovy should be prepared as you would other game-meat - this one is best served rare to medium rare. You'll want to roast it hot and fast at a reasonably high temperature: 475 degrees, basting often, from 11 to 15 minutes per pound. Allow the internal temperature to reach 155 - 165 degrees for a rare to medium-rare result. 1/3 of the way through the cooking you should cut off the breast meat and continue roasting the rest. Immediately before serving, sear the breast (skin side down) for a minute or two. Follow this post for pictures. The meat pairs well with sweet/tart combinations, such as tart dried cherries, pomegranate molasses, orange, clementine, lemon, and honey, or any combination of those. They also take well to somewhat unusual spices such as dried coriander, star anise, or allspice. Great dishes to serve alongside are winter vegetables such as squash, parsnips, carrots, celeriac, or turnips. You can par-cook and then add the vegetables to the roasting pan around the bird for a simple, but supremely elegant, one pan meal. The choicest part of the Muscovy is the breast. When the duck is done, transfer it to a carving board and neatly carve away half of its breast. Place the breast half skin-side up on the board and cut it slightly on the bias, as with London broil. 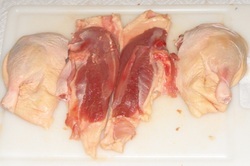 The thighs may be carved off the bone into thin slices. Initially bred in South America, Muscovy is not actually a duck but a large perching waterfowl. It's by far the leanest domesticated waterfowl at market and cooks in less time while providing a crispier skin. Long a holiday favorite in France, Muscovy is becoming very popular here in the United States. Loaded with big flavor, big value, little fat, and a unique taste, it’s exceptionally lean and tender and responds well to simple seasoning. Due to a higher meat to bone ratio, the average 4 lb. Muscovy hen has a higher yield and 50 percent more breast meat than other waterfowl. A larger bird will provide even better value with about the same amount of bone but far more meat. Muscovy breast meat is 98 percent fat free and the skin has far less fat than the Moulard or Pekin… it even has less fat and calories per pound than turkey. With much thanks the Hank Shaw, here's a step-by-step photo tour for searing duck breast. Be forewarned that simply looking will make you hungry! You may also want to check out his cookbook Hunt Gather Cook. A guided instruction for scoring and rendering a duck breast. Print it, save it, use it often. The secret to having crispy duck breast skin is to score the skin and sauté the breast on its skin side over low heat, so the fat has a chance to render or melt out of the skin. By properly cooking duck, you melt the available fat, which leaves a delicious, crisp skin that adds to the distinct favor of the meat. Muscovy meat is so flavorful that you can serve simply seasoned meals with gourmet panache. Make braised Muscovy by searing the outside then cooking in a covered roaster until it falls off the bone... this produces a very tender, richly flavored dish. Prepare Smoked Drake Breast that is wonderfully moist and smooth. Dressing up a simple salad is just as easy as adding your smoked meat to a mixed green salad with a walnut vinaigrette and topping it with thin slices of smoked Muscovy breast. 1/2 cup chicken broth 2 tablespoons butter. 2. Cut off and reserve the wing tips and second wing joint of the duck. Leave the main wing bone intact. Remove the fat from inside the duck and rub it all over the duck. 3. Sprinkle the Muscovy, inside and out, with salt and pepper to taste. Brush the duck with the oil. 4. Arrange the duck breast-side up in a roasting pan. Add the cutoff wing bones, gizzard and cavity fat. Bake 30 minutes and pour off the fat from the roasting pan. Return the duck to the oven and scatter the celery, onion, carrot, bay leaf, thyme and garlic around the duck. Bake 15 minutes longer if you wish the duck to be medium rare. Or bake it 30 minutes or longer if you wish your duck well done. 5. Transfer the duck to a warm platter. Pour the fat from the roasting pan, leaving the vegetables in the pan. Place the pan on the stove and cook the vegetables briefly, stirring. Add the wine and let boil about one minute. 6. Add the broth and accumulated cavity drippings from the duck and cook, stirring, about five minutes. Strain the broth and solids, pushing the solids with the back of a spoon to extract as much liquid as possible. 7. Heat the butter in a small saucepan, swirling it around until it takes on a nice hazelnut color. Do not burn. Pour the butter over the duck. Carve and serve with the hot pan sauce. Braising is a combination cooking method using both moist and dry heat; typically the food is first seared at a high temperature and then finished in a covered pot with a variable amount of liquid, resulting in a wonderful flavor and tenderness. Crispy braised Muscovy is a simple, luxurious dish. Take your time browning the bird until the skin is crackly and golden, then cook everything together in the roaster until the bird is tender and super-crisp, the vegetables are melting and unctuous, and the liquid is reduced into a sauce you want to slurp up with a straw. 2. Using a rotisserie, brown the bird all over until golden (475* for approx 10 min) This can be achieved in the oven by turning the bird often. 3. Place all ingredients in a crockpot set on low, (or a covered roaster in a 200* oven, or a large heavy-bottomed pot on a very low burner), for approximately 6 hours, until the meat falls off the bone. If your pot doesn't have room for all the ingredients, the cabbage can be cooked separately, preferably in the pot liquor. Goes best with potatoes or noodles, and would also be wonderful with spaetzle. In a large Dutch oven, over medium heat, warm 2 tablespoons olive oil. Sauté the garlic, celery, onion, and carrot until soft and tender, about 10 minutes. Add the flageolets, their soaking water and more cold water if necessary to cover the beans by 1 inch. Bring to a boil, reduce the heat to medium low and gently simmer until the beans are almost tender, about an hour. Season with salt and pepper to taste and continue to cook until the beans are soft, another 30 minutes. Remove the celery, onion and carrot, and set them aside to cool. Once cool, chop the vegetables into a small dice and add them back to the flageolets. Preheat oven to 400 degrees F. Heat a large sauté pan over medium high heat, place the duck breasts in the pan, skin side down. Reduce heat to medium and cook duck breast for 5 minutes. Place pan in the oven and continue to cook for another 5 minutes for medium rare. Allow duck breast to rest for at least 5 minutes before slicing. Reheat flageolets, if necessary. Ladle flageolets onto the center of the plate, lay sliced duck breast over flageolets and spoon Beurre Rouge around the duck. Garnish with chopped parsley and serve immediately. This recipe was featured in the Best of Beans Episode of Emeril Green. Prepare fire by piling charcoal or lava rocks on each side of grill, leaving center empty. Place a drip pan between coals. Coat food rack with vegetable cooking spray, and place on grill. Arrange breasts, skin side up, over drip pan. Grill, covered with grill lid, over medium-high heat (350° to 400°) about 30 minutes or until a meat thermometer inserted into thickest portion registers 160°, basting occasionally with reserved juice concentrate mixture. 2. Preheat oven to 475°F. Trim any excess fat from duck breasts. Cut three 4 inch long by 1/16 inch deep lengthwise slits in skin (not meat) of duck. Season duck with salt and pepper. Heat heavy large ovenproof skillet over high heat until hot. Add duck, skin side down, and sear until brown, about 3 minutes. Turn over; cook 3 minutes. Transfer skillet to oven; continue cooking to desired doneness, about 3 minutes for medium. 3. Meanwhile, bring sauce to simmer over low heat. Add remaining 1 tablespoon butter and whisk just until melted. Season to taste with salt and pepper. 4. Spoon sauce onto plates. Slice duck and place atop sauce. Garnish with additional berries. Set a large saute pan over medium heat. Season the duck breasts with 1 teaspoon of salt, and 1/2 teaspoon of black pepper. Lay the duck breasts skin-side down in the hot saute pan and sear until golden brown and most of the fat had rendered from the skin, about 6 minutes. Pour off the excess fat from the pan, and turn the breasts over. Continue to cook the breasts on the flesh side for another 6 minutes. Remove the pan from the heat and place in the oven. Cook for 5 minutes, and remove to cool before slicing. Slice the duck thinly using an electric knife or a carving knife. Heat the olive oil over a medium-high heat in a 10-inch saute pan. Once the oil is hot, add the shallots and garlic to the pan. Sweat, stirring continuously, for 1 minute. Add the blackberries to the pan and cook for 2 minutes. Deglaze the pan with the white balsamic and regular balsamic vinegars and allow it to reduce by half, about 30 seconds. Remove the pan from the heat and place the contents in a bar blender with the sugar, mint and tarragon. Pulse the berries in the blender until a smooth paste forms. With the machine running, season the berries with the salt and pepper and drizzle the light olive oil into the blender. Once blended, strain the vinaigrette through a fine mesh sieve and allow it to cool completely before using, about 1 hour under refrigeration. To assemble the salad, place the arugula, radicchio, walnuts, apples and goat cheese in a large mixing bowl with the endive spears. Toss the greens with the vinaigrette, season with salt and fresh ground black pepper. Divide the salad among 4 plates, and fan 1/2 a duck breast over each of the 4 plates.